When your only godchild has a birthday, you have to party in style. I am not going to lie, I spoil my godson Michael more than most people spoil their own children. 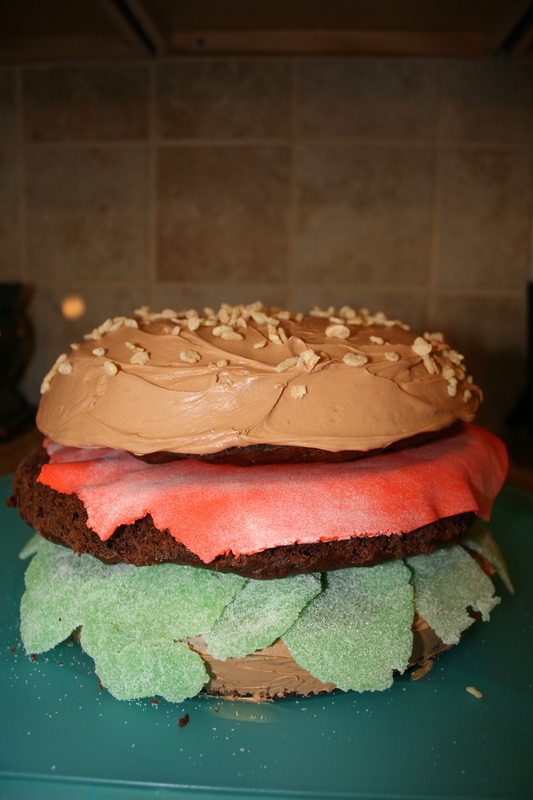 So when I was asked to make his birthday cake, I could not allow myself to just make a simple one. I went all out and surprised him with this bad boy. I can’t take all the credit. I originally saw this in last summer’s July/August issue of Food Network Magazine. I did minimal changes to it. However, their orange fondant was light and, you know, cheese-like, where mine came out as neon madness. Michael kept telling people it was ketchup. Gotta love a kid who covers for me when I make mistakes. 2. Mix cake mixes, buttermilk, eggs, and applesauce in a mixer until well incorporated. 3. Split the mixture into three. Generously spray 1 bowl and 2 circular cake pans with cooking oil and pour 1/3 of the mix into each. 4. Bake the mixture in the bowl for 45 minutes. Let cool completely. 5. Bake the two cake pans for 25 minutes. Let cool completely. 6. While cakes are cooling, make the frosting by emptying the tub of vanilla frosting into a large bowl. Add 3 tablespoons of the chocolate frosting, and the yellow and red food colorings. Mix until the mixture is a light beige. If it is still too dark, add more yellow food coloring. 7. Place the first circular cake onto whatever you will serve your cake on or whatever you’re transporting it in. (Once you start assembling the burger it is best to not move it to another surface.) 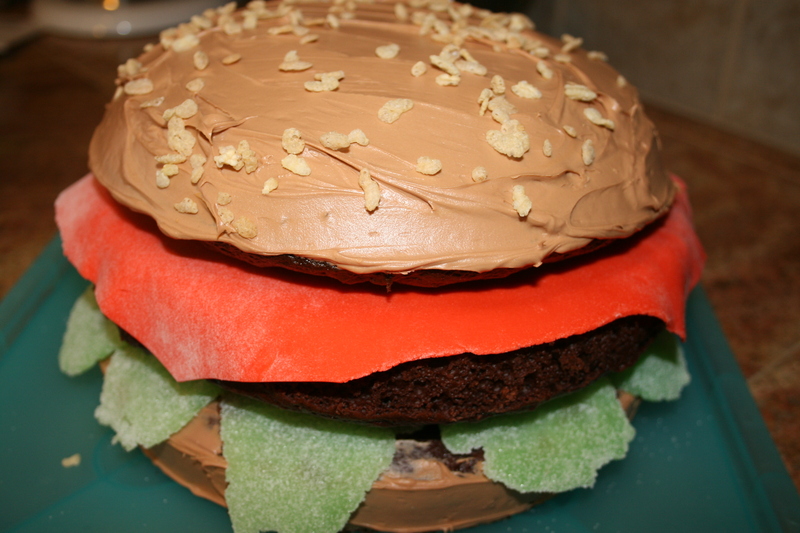 Ice the outside of the cake with your frosting. 8. Spread a thin chocolate layer on the top edges of the cake. This is so your “lettuce” will stick. 9. Put some sugar on a cutting board. Roll out each piece of your fruit slice candy and use your fingers to shape them into leaf-like objects. Rub a little more sugar on them to help them keep their shape. Assemble these candies with half of each piece on the cake and half sticking over. 10. Place the second circular cake on top. Breathe because you’re halfway through! 11. Roll out your fondant into a thin piece, about 1/4”. Cut it into a square that is large enough to hang slightly over the chocolate cake you just put on (your patty). You can trim off some once it is on if it is still too large of a piece. 12. Place the round-bottomed cake upside down onto the fondant. Frost the top and sides completely. 13. Carefully place Rice Krispies on top to resemble the sesame seeds. 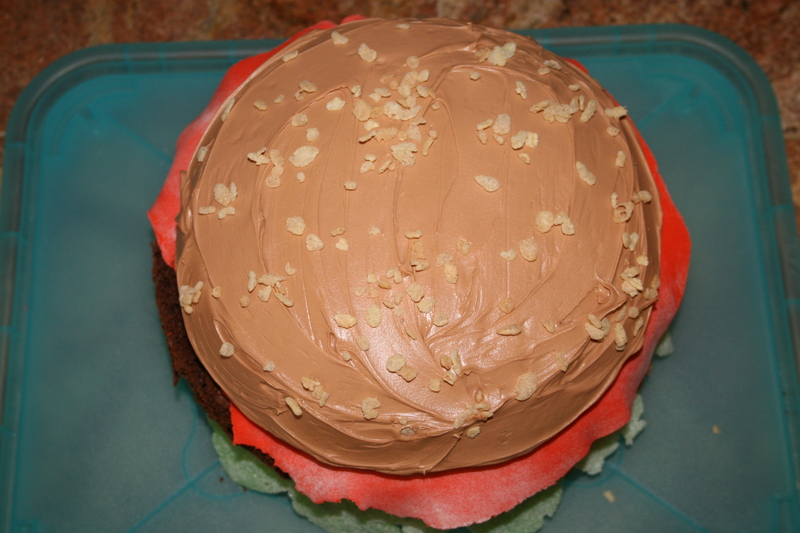 This entry was posted in Desserts and tagged birthday, cake, cheeseburger, creative. Bookmark the permalink.